On "Connections," Friday, November 14 at 8:30 AM on KGNU - FM 88.5, AM 1390 - Duncan Campbell and I will continue a discussion of Sand Creek and the recognition of deep and painful historical connections - for instance, about how we think about John Evans and how to make a way forward, with our indigenous descendants/brothers and sisters in a multiracial democracy. We will also respond to questions/arguments from listeners. For part one this past Sunday, November 9th, listen here. A vision of history which aims for and honors the truth is often an occasion of regret and shame. and therefore painful (though there are people one can recall with admiration like Silas Soule, murdered for telling the truth and Black Kettle, the peace seeker against the murderous United States army - he and his wife were attacked at Sand Creek on November 29, 1864 and barely escaped; they were murdered 4 years later at the Washita River in a massacre led by George Armstrong Custer, November 28, 1868 - as well as many, among the survivors, who fought back and even told the story like George Bent. And there is, as Duncan mentions, Niwot - Left Hand - anoter peace seeker, killed at Sand Creek. This is true in Germany (and elsewhere in Europe) about the Holocaust toward Jews, Roma and Slavs (the leading aspect was racism toward Jews but this was used as a cover to take out many other "defectives," even killing 25,000 "defective Aryan children" with barbiturate poisoning and murdering every mental patient - some 297,000 - in Germany). It is also true about this American Holocaust (the killing of indigenous people across the country, the cutting off of heads and sending skulls, including from Sand Creek, some 20,000 of them, to the Smithsonian. The need for retrieval of the body parts of Native Americans by descendants - there is a Congressional Act with this name - is another part of this story). I heard Henrietta Mann, a Southern Cheyenne and a great educator who founded the indigenous studies program at Berkeley, taught on Montana State for many years and has recently founded a college for indigenous education - Cheyenne and Arapaho Tribal College - in Oklahoma (at Southwestern Oklahoma State), speak about Sand Creek at the University of Denver Wednesday. In the course of a powerful talk, she praised our Report and recommendations (though she called brilliantly for a Marshall Plan for indigenous communities...). You can read the Report here. The Northwestern indigenous students whose protest launched the investigations and reports of both universities, too, found the Report a "relief" and "humanizing" (though the Northwestern Report gives a lot of valuable information and finds Evans conduct occasionally "nothing short of appalling," our Report, drawing on wider evidence and probing, for instance, Evans' Proclamations which Northwestern leaves in shadow, makes clear his culpability (his abject failure as ex officio Supervisor of Indian Agents to seek peace even at Camp Weld on September 28, 1864, where 8 Cheyenne and Arapaho leaders tried, in spite of all, to make peace with him, and his curious role, though he had no military authority, as Governor both as the loudest advocate for war on the Plains from late 1863 on and even the declarer of war in his Proclamations of June 27th and August 11th, 1864). 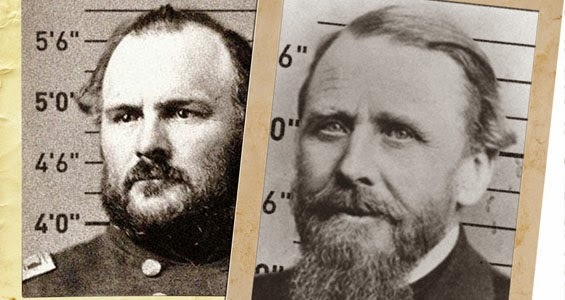 A DU committee found both John Chivington and John Evans culpable for the Sand Creek Massacre. When you're trying to right a 150-year-old wrong, you do not want to make another mistake. You do not want to add insult to grievous injury. That's why the members of the University of Denver's John Evans Study Committee took such care with their investigation of the connection between John Evans, the territorial governor (and thus Supervisor of Indian Affairs in Colorado) who founded the forerunner to DU, and the Sand Creek Massacre. 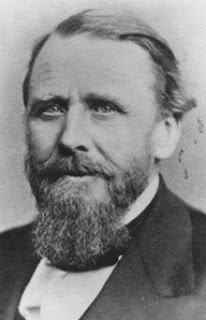 And last week, fourteen months after the members of the committee -- comprising academics, students and alumni, outside historians and descendants of those killed at Sand Creek -- first convened, they released a report that concluded "John Evans's pattern of neglect of his treaty-negotiating duties, his leadership failures, and his reckless decision-making in 1864 combine to clearly demonstrate a significant level of culpability for the Sand Creek Massacre." That was the horrific event on November 29, 1864, when Colonel John Chivington -- co-founder of the Colorado Seminary and not just an ardent Methodist like Evans, but an actual minister -- led more than 600 troops, including regular Army officer and volunteers with the Third Colorado Calvary, previously known as the "Bloodless Third," in a very bloody raid on a peaceful camp of Arapaho and Cheyenne camped along Sand Creek -- where the tribes had been told to go by U.S. Army officers stationed at Fort Lyons. Where they were told they'd be safe. Instead, at least 150 members of the tribes, most of them women, children and the elderly, were brutally murdered. "While not of the same character, Evans's culpability is comparable in degree to that of Colonel John Chivington, the military commander who personally planned and carried out the massacre," the committee determined. "Evans's actions and influence, more than those of any other political official in Colorado Territory, created the conditions in which the massacre was highly likely." And over the next hundred pages, the committee members stated their case, showing how Evans whipped up hysteria over non-existent raids, begged the Army for another [regiment of] 100 [days] men to combat "these infernal Indians," issued a June 27, 1864, proclamation to "the friendly Indians of the Plains" that "comes close to being an official declaration of war," the committee notes -- and then issued a second proclamation on August 11, 1864, that came even closer, at the same time that the "friendly Indians" were being stymied in their attempts to comply with the first proclamation. They compare Evans's actions to those of his colleagues in Utah and Nevada, who were able to negotiate peacefully with the Indians in their territories. And they compare their findings to a report issued in May by Northwestern University, which had been founded by Evans in 1850, and took its own, not-as-hard look at Evans's legacy. 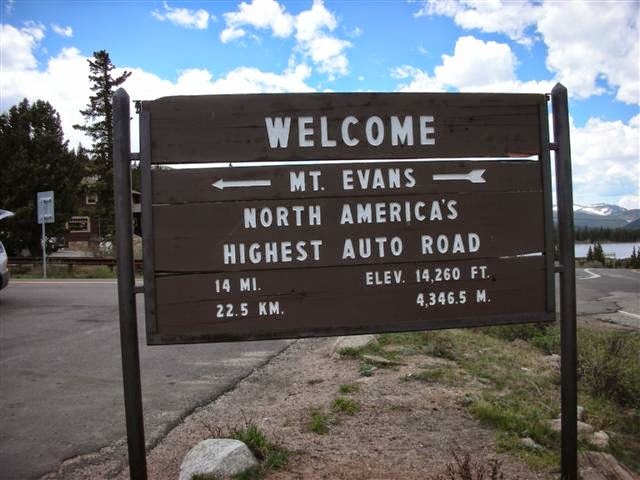 The entrance to Mount Evans. The DU committee is not the first to find fault with Evans; three federal investigations conducted in the wake of Sand Creek determined that the action was indeed a massacre and President Andrew Johnson called for Evans's resignation. But this is the first critical report issued by people working in the shadow of a mountain commemorating John Evans, along a street named for him, at an institution where the highest honor is to be a John Evans Professor...even if current John Evans Professor Alan Gilbert, who served on the committee, is one of his harshest critics. And the committee did not stop its work after finding Evans culpable. The members went on to offer 22 recommendations for how DU can "be a change leader illuminating a new path forward: a path of unity, collaboration, and healing for all communities." Among the possible steps on that path would be creating forums to discuss possible renaming of campus buildings, positions and awards, "without historical erasure." The explanatory plaque added at the Capitol. Forgetting history is not fixing it. In the late '90s, there was a proposal to remove a line on the Civil War Monument at the State Capitol -- which lists Sand Creek as a battle in that war. 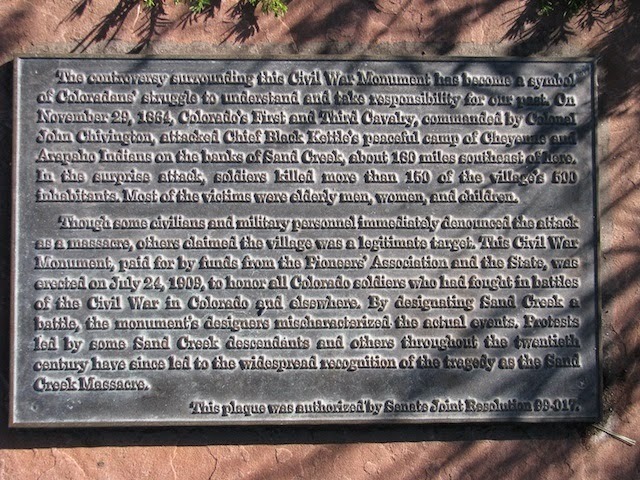 Rather than allow history to be erased, tribal representatives and historians worked together to persuade legislators to instead add a second plaque to the monument in 2002, one that suggests "the controversy surrounding this Civil War monument has become a symbol of Coloradans' struggle to understand and take responsibility for our past." A dozen years later, as a change.org petition was pushing to rename the town of Chivington, once a bustling burg outside of Eads that today is a ghost town, members of the Sand Creek Massacre Commemoration Commission were meeting just a few miles away at the Sand Creek Massacre National Historic Site. The Chivington name change concept came up, and the tribal representatives were unanimous in the belief that the name should stay. "It was helpful to hear the tribes talk about that," says Nancy Wadsworth, an associate professor in DU's Department of Political Science who pushed the university's report through. The Evans name and legacy are a burden that DU will have to bear. "We could have sidestepped the issue of culpability, but it felt like that would have been dishonest," says Wadsworth. "We tried to be courageous here." And they were: They got a tough job done at the same time that the university's attempts to settle a sticky mascot issue have stalled; they issued their report criticizing DU's founder the same year the school is celebrating its sesquicentennial; they shouldered a heavy historic burden that is impossible to deny." Following the University of Denver’s release of its John Evans Study Committee findings, some Northwestern students praised the new report, while a member of NU’s committee defended its own conclusions on the University founder’s role in the Sand Creek Massacre. “It seems like DU had a better, deeper understanding of the importance of this whole process of trying to go forward and recognizing our past,” said Bienen junior Wilson Smith, co-president of the NU Native American and Indigenous Student Alliance. “DU centered Cheyenne people in their research process, and the result is a strong report and recommendations in contrast to NU’s colonial and dehumanizing report,” she said in an email to The Daily. Carl Smith said he was “puzzled” by DU’s choice to devote a section of its report to the two conclusions’ differences. Wadsworth added that NU’s report was nevertheless “very critical” of Evans. The NU report characterized Evans’ actions before and after the massacre as “significant moral failures” that the University has ignored."